Ben Franklin! 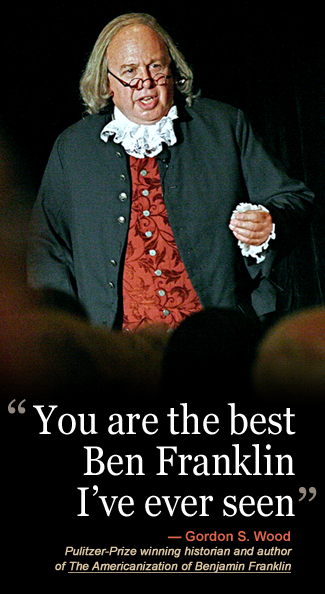 Witty, wise, and warmly human, Ben will make an unforgettable speaker for your next event. 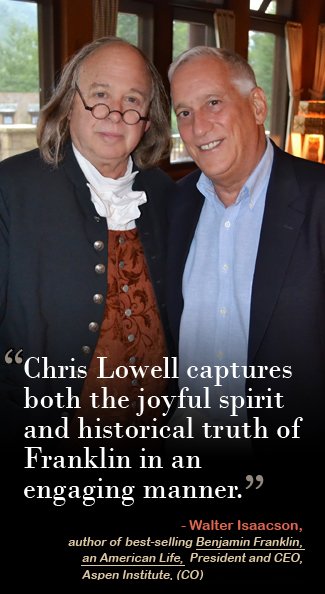 As Franklin, Chris tailors the length, content and tone of his presentations, emphasizing those aspects of Ben’s remarkable life that are particularly relevant to each, individual audience. Chris’s long, dual career as both teacher and award-winning stage actor combine to bring Ben to life with historical accuracy, wit, and a high level of theatricality. Audiences will gain a deeper appreciation for America’s beginnings and for the many contributions Franklin made to his community and new nation. Following each presentation, Chris conducts a lively Q&A as Ben, furthering the connection between yesterday and today.